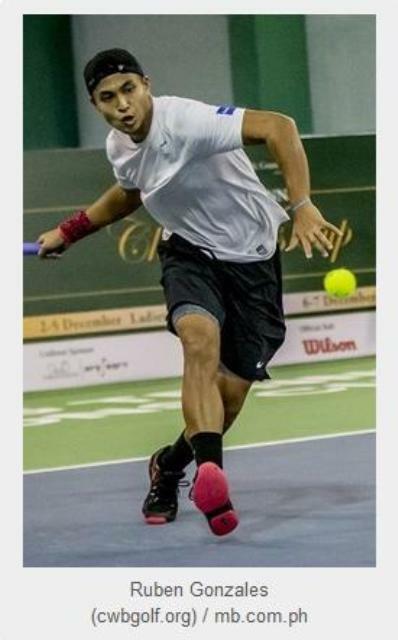 Filipino-American tennis player Ruben Gonzales made it to the men’s doubles final of the ATP Challenger China International in Nanchang over the weekend. Gonzales, a member of the Philippine Davis Cup team, and Nicolas Barrientos of Colombia, who was ranked No. 71 two years ago, however, failed to lift the championship trophy after losing to Chinese pair Wu Di and Zhang Zhizhen, 7-6 (4), 6-3. Gonzales and Barrientos defeated Jeeven Nedunchezhiyan of India and Amir Weintraub of Israel, 7-5, 2-6, 10-4, in the semifinal round of the USD75,000 tournament to arrange a title showdown with Wu and Zhang. Wu and Zhang, on the other hand, scored a 7-5, 7-6 victory over Taiwanese tandem Ti Chen and Jason Jung to advance in the final. Gonzales and Barrientos pulled off a 6-3, 6-3 upset over top seeds Sergey Betov of Belarus and Denys Molchanov of Ukraine in the quarterfinal round. In the singles category, unseeded Japanese Hiroki Moriya defeated fourth seed Hyeon Chung of South Korea, 4-6, 6-1, 6-4, to pocket his second title since winning his maiden Challenger crown in Canada two years ago. On his way to the final, the 25-year-old Moriya defeated Matija Pecotic of Croatia, 6-4, 6-4: third seed compatriot Tatsuma Ito, 6-4, 6-0; seventh seed American Alexander Sarkissian, 6-1, 7-5; and Australian Marinko Matosevic, 7-5, 0-6, 6-4.